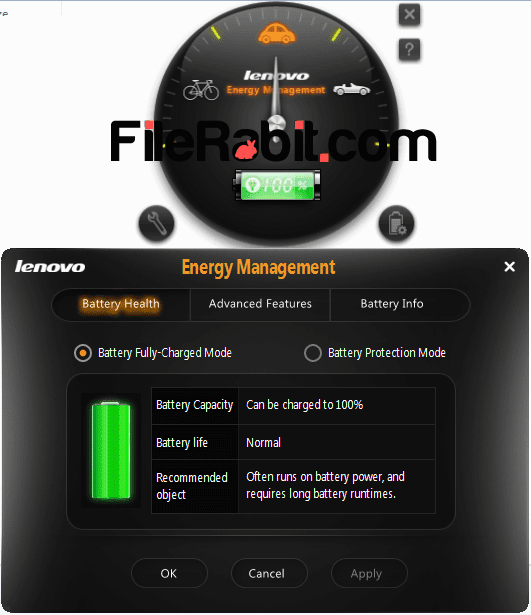 Lenovo Energy Management is advance application used to gain battery health, get detailed battery basic information and perform fan dust extraction and also battery gauge reset features. After installation, an toolbar will appear in taskbar which will be used to switch between battery modes. 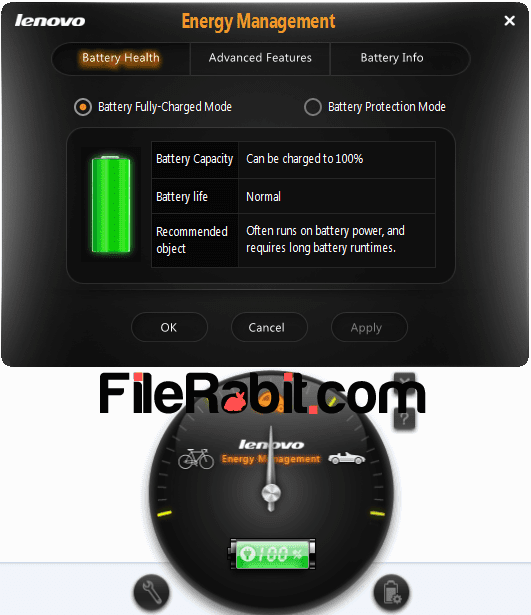 Mostly used battery or power modes are Balanced (standard), Power Saver and high performance. These modes can be switched through Control Panel > Power Options but its time taking procedure. Lenovo Energy Management has three symbols showing on its main logo screen. These three symbols are showing in Cycle, 3rd generation car and 1st generation car. A single click on any symbol will change power mode between power saver, balanced and high performance. Balanced: Will limiting hardware and OS to consume power in automotive balanced mode. High Performance: Will accelerate battery consumption but will decrease overall battery timing with boosting brightness level. Power Saver: Will decrease brightness and other energy consumption things to increase battery timing as well as reducing computer performance. Fan Dust Extraction: Laptop or notebook fan is used to decrease inside heating but the fan will catch dust from inner and outer sides. Many systems will cause problems because dust will close the route of wind. Fan dust extraction mode will speed laptop fan on maximum speed to throw dust outside the laptop’s case. Battery Gauge Reset: If a battery is causing troubleshooting while charging or hurt battery timings then it can be fixed through reseting battery gauge. Many batteries will not be charged at maximum level or offering less capacity so try a battery gauge reset to get rid of troubles. Switch Modes Rapidly: Can switch between high performance, balanced and power saver rapidly through single click on car or cycle icon. It’s time saving and fast way to switch between power modes.